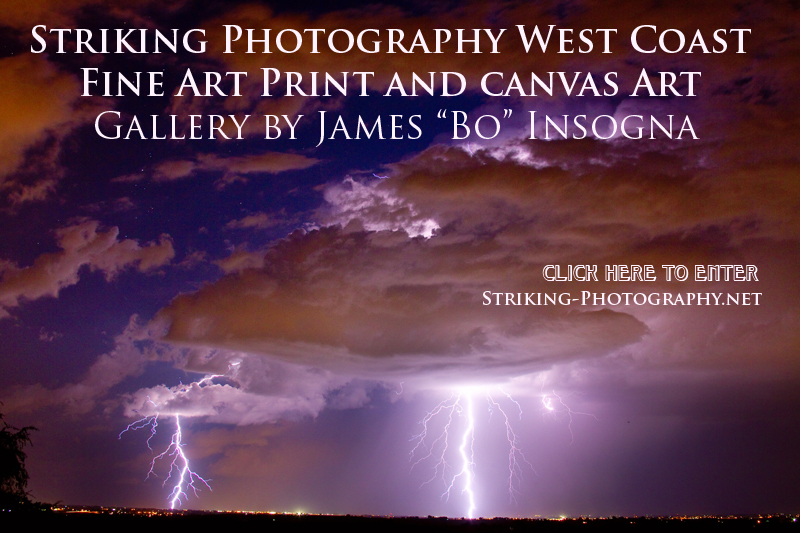 Welcome to Bo's Insogna On-Line Fine Art Striking Photography West Coast Gallery. Buy Fine Art Prints, Custom Framed Prints, Prints on Canvas and Poster Art available all sizes. Guaranteed to liven any decor. Great to decorate your home walls, office walls, cafe, restaurant, boardroom, waiting room or almost any commercial space. Fine Art Prints are also a great gift idea. All artwork has a 30-day, no questions asked, return policy. Plus All transactions are secure and private with FAST Worldwide shipping to your door. Bo Insogna, also known as "The Lightning Man" and Striking Photography by Bo Insogna. Bo's lightning photography image art work has appeared in magazines, on book covers, newspaper features and on television. Thank for stopping by. Please share this site with your friends your referrals are greatly appreciated..